Our 54 room Property is conveniently located on White Sands in Alamogordo, NM. The White Sands National Monument, Space Hall and Otero County Fairgrounds are close by. Everything you need, whether you are visiting for business or pleasure, is nearby. 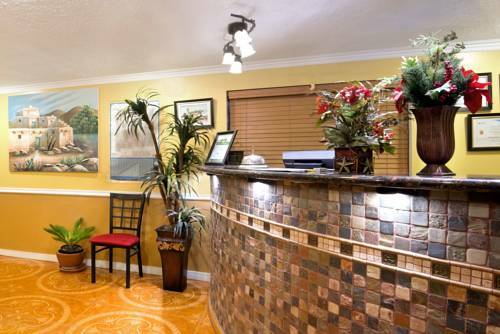 We are located within walking distance to shops and have restaurant and lounge right next door. The White Sands Mall is just across the street. The Super 8 has interior corridors, a guest laundry on the premises our guestrooms amenities include - 27 Inch TVs, premier channels, In room coffee makers, hair dryers, AM/FM clock radios, microwaves and refrigerators in all rooms. Our King and Queen bedded rooms have recliners for your relaxation. We are AAA 2 diamond rated Property and have been awarded the Pride of Super 8. We offer free local calls and complimentary Wi-Fi Internet access throughout the property. Rollaways available. Come and visit and be rewarded with great rooms at an affordable price and experience our Southwestern hospitality for yourself. We do accept pets with a pet fee per night. The final resting place of Ham; in January 1961 he became the first chimp launched into space. Smokey Bear was a cartoon character and a real bear. A cartoon lives forever, but the real bear died during the Bicentennial. He's buried under a tree. This physically challenged fiberglass statue somehow holds a sign for his flea market, an inspiring triumph of will and wire.